It was a moment where the language barrier didn’t matter. It was as if the entire world stopped, even just for that split second in time. The regulated beeping of machines continued and brought me back into the reality of the present moment. “Se falleció,” the nurse shared. I hadn’t even heard of that verb before, but the shared response of the hospital room was enough to know. Their faces dropped– every patient, kinesiologist, therapist, doctor, nurse, tech, and visitor. My own heart sunk, too, and it was a strange feeling. I had seen the patient in a coma just minutes before the news broke. I had no connection to her nor to her family. I didn’t even know the state of her condition and, yet, I could still feel the pain. It was a purely human moment. The therapy sessions progressed, the conversations continued, and life at Hospital Sótero del Río went on, as it always does. I briefly departed my current observation to confirm what I thought was the situation. I went next door to the room of 6 neurology patients to find the loved ones of the deceased woman grasping onto her in the hospital bed, still so close and yet so far from her last breath. The nurses, tears in their eyes, continued their routine duties in preparation for the next patient to take her very place in the already-crowded room. It felt so human. As future health professionals, we talk a lot about how to separate our feelings from our jobs and how to not bring our work home with us. We will evidently become a bit desensitized to the looks and groans of agonizing pain of our patients, even the sight of death of a patient whose life we have fought and cared for. In this moment, however, I don’t believe the nurses or doctors were worried about hiding their sadness or avoiding the emotions that were provoked. Instead, I saw sympathy and understanding. I saw gentle looks exchanged between medical personnel and the loved ones of the woman. I heard the booming noise of silence that resulted from a lack of any words that could have possibly alleviated the pain of the situation. I, too, felt helpless. Even if I had the words in Spanish, I wouldn’t have been able to convey them in a way that could have helped anyone. There was no easy fix. Death is a reality of life, but it was a beautiful moment of unity and humanity that exists apart from language or culture. It was simply an aspect of “ser humano” (being human). It’s one of those nights that I can’t stop gazing out the window. 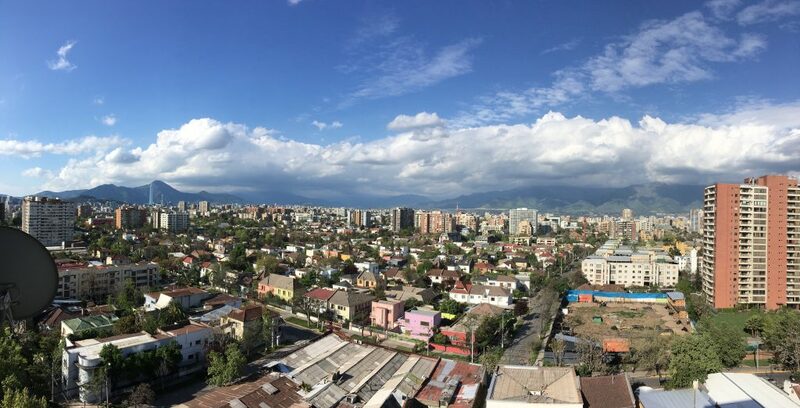 I pace back and forth between the terrace, which faces east towards the Andes cordillera and my bedroom, which faces south towards even more mountains that I am seeing for the very first time, thanks to yesterday’s rain. My study break is well-spent admiring the sunset over the cordillera, a view that never gets old and makes me temporarily forget about the Lake Michigan sunsets that I’ll return to in the blink of an eye. The view from the terrace never gets old! It’s one of those nights that I just want to hang out with my host mom because I still can’t believe I am living in an actual Chilean home and have semester-long access to speaking Spanish whenever I want (I’m not always this optimistic about that). 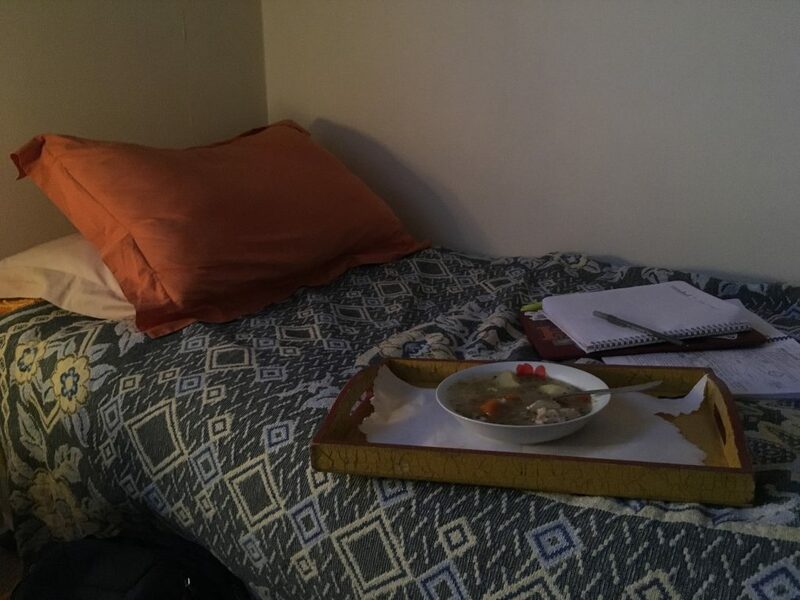 I sit down with a bowl of cazuela and reminisce on the first day that I arrived in Santiago when my host mom and I conversed for hours over a bowl of cazuela (well, she talked and I nodded and pretended that I understood Chilean Spanish… some things don’t change). Two months later, I now know that you’re supposed to drink the broth first before digging into the meat and veggies, but I still stick to my old ways. My host mom makes the best cazuela! It’s one of those nights that I can’t actually get anything done because I am straddling between planning my upcoming trips and flipping through photos of the many adventures I have already had on the wild weekend trips. I am stuck in this weird in-between… it’s a nostalgia for the places I have yet to go and a longing to relive the moments that have already passed, all the while trying to be present in this very day of October 1. Study abroad has been packed with new experiences. 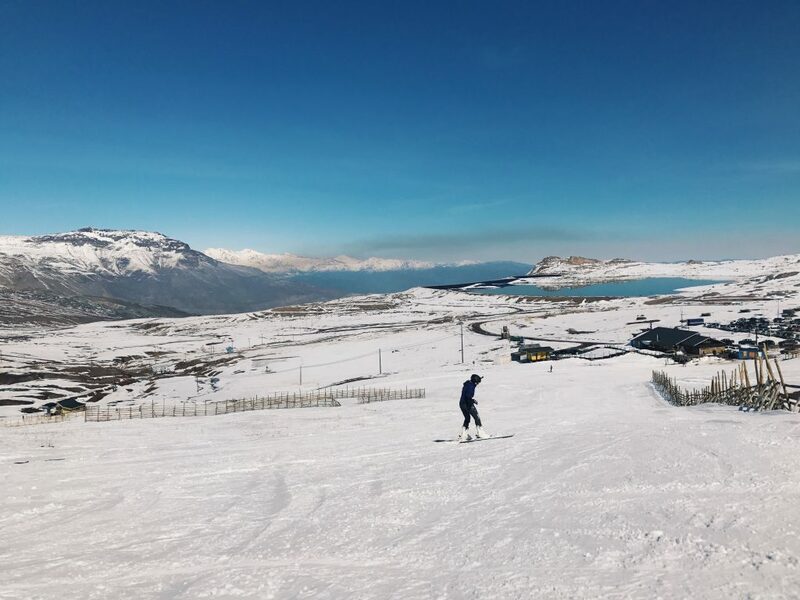 Here’s one I’ll never forget: skiing for the very first time… in the Andes! 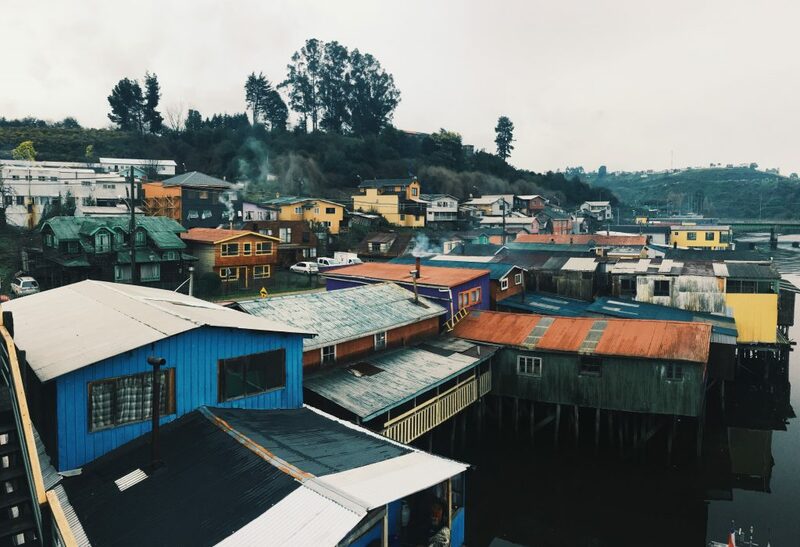 Another great memory: the infamous stilt houses (palafitas) in Castro, a city on the mythical island of Chiloé. This was an IES-sponsored trip that most of my group went on last month. 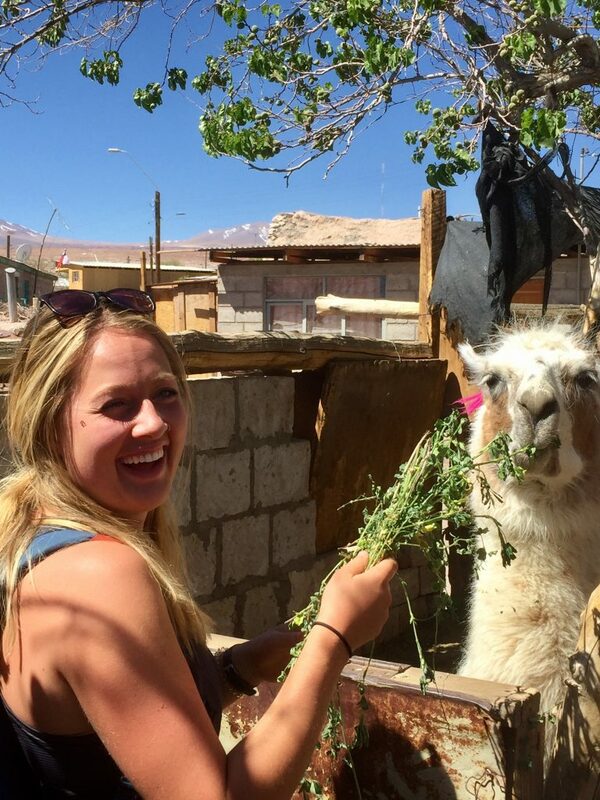 The classic South American photo-op with a llama! This was taken on my spring break trip to San Pedro de Atacama, the desert region in northern Chile. It was tonight that I realized how content I truly am. Disclaimer: study abroad is not all peaches ‘n cream and I have probably had more tough than easy days. There have been days of frustration, regret, and just wanting to throw in the towel on this whole “get out of your comfort zone” thing. However, I am learning that being content does not come from a compilation of good and easy days. It is a feeling that has come from trials and tribulations, from being forced out of the comfort zone day-in and day-out, and for the joy that arises from experiencing growth like I never have before. One of my favorite Bible verses says, “I know what it is to be in need, and I know what it is to have plenty. I have learned the secret of being content in any and every situation, whether well fed or hungry, whether living in plenty or in want,” (Philippians 4:12). As I continue into my last couple of months, I cling to this: that the good and the bad and everything in between is all a part of the study abroad experience. Even more, it is a part of the life experience, and I am thankful for the growth that still is to come. I began dreaming of my college study abroad semester pretty early on in my high school Spanish classes (what else would have motivated me to get through all those “preterite versus imperfect” lectures?). During Hope prospective student visit days, I sat front row at every off-campus study info session, stored away all the pamphlets, and talked to countless students about their experiences abroad. When I arrived at Hope in Fall 2014, I plotted out my 4-Year Plan based entirely upon my semester abroad. However, when it came time to actually make the plans a reality, fear and anxiety crept in. It wasn’t that I lost the desire to go abroad, but rather that I didn’t want to leave Hope for a semester. Clearly, events occurred that changed my mind, because here I am writing from Chile. I can confidently say that I am exactly where I am supposed to be– being challenged, humbled, and left in wonder by this new home of mine. However, I will break the myth that every day abroad is as much of an adventure as an Instagram picture or blog post may convey. This past weekend at Hope was Orientation Weekend. Having been a part of the Orientation Staff for the past two years and loving freshman orientation myself, it has been incredibly difficult to miss out on the best weekend of the year. Flipping through all the Instagrams and Snapchats, the reality hits that life goes on without you. When your friends are all moving in together and reuniting after summers apart, you’re not a part of the group texts to meet up at New Holland, Captain Sundae, or a Lake Michigan sunset. No matter how much we glorify FaceTime and Skype to keep us connected, nothing adequately compensates for the 10,000 miles of distance that exists. Amidst the FOMO, I am reminded of the gift it is to have a place and people to miss. I would not trade this adventure abroad for anything– even for my long-awaited senior year fall semester at Hope. As I write this, I fear that this is just the beginning of the FOMO. There will be an abundance of things to miss out on, and plenty more anticlimactic days abroad. However, when I allow myself to sit in that ache to be with the people that know me the best and in the place that I feel the most at home, I am grateful to carry that sense of belonging with me. Best of all, it’s what will welcome me home in just a few months!